Hong Kong is an international city and it has vast number of tourists come from all over the world in all year round. According to the Hong Kong Government statistics, the number of international tourists visited Hong Kong in 2005 reaches 10.8 million which represents a 13.1% increase when compared to 2004. Countries such as Australia, Canada, French, China, India, Indonesia, Malaysia, Singapore, Korean, Thailand, British and United States all contributes significant tourist growth for Hong Kong. This article presents some critical traveler tips for tourists so that you could enjoy more and have a wonderful trip to Hong Kong. Tourists must carry valid personal identity documentation such as passport during their stay in Hong Kong. Hong Kong is a very safe city according to the low crime rate. However, due to the densely population, it is not suggested to take a large amount of cash when going out since most of the shops in Hong Kong accepts credit cards. Expensive belongs should be locked in the safe in hotel. You could easily find policemen on the streets whenever you have encountered any problems. Most of the restaurants except fast food shops will add 10% service charges to the bill. Therefore, you may choose to give out the odd dollars from the changes as the service tips. For taxi driver or bellboy in the hotel, there is no pre set norm for the service tips, you may choose to give out whenever you think the service is deserved for. All local telephone call is free except for the public telephone which charges HK$1 for every 5 minutes. Emergency call is 999 and it is free to call even in public telephone. You could either use IDD telephone call card or credit card for long distance call, or simply through operator for collect call in all public telephone counter. The drinking water in Hong Kong reaches World Health Organization standard. However, you may also choose to buy the bottle water in the supermarkets if you think it is necessary. All taxi only accept cash and they have invoice print out whenever you request. It is easier to catch the taxi in the taxi stop or outside the hotel. Many of the taxi drivers could understand simple English. It is suggest writing down your destination (in English) on paper to minimize misunderstandings. The taxi charges is based on the meter which is HK$15 for the first 2 Km and HK$1.4 for the subsequent 0.2 Km. Besides, there are tunnel charges ranging from HK$3-45 depends on which tunnel you have to take. The charging table is clearly shown on the inner side of the doors so you could check it before you pay. In case of any complaints or lost case, you may record down the name of the taxi driver and his license plate number which is clearly shown on the front seat stand, and reports to the police hotline: 2527 7177 whenever necessary. Hong Kong has 6 MTR routes, which covers most parts of Hong Kong Island, Kowloon and New Territories. Due to the convenience of MTR and the compact area of Hong Kong, most tourists find it is not necessary to rent car during their stay. Besides, due to the very heavy traffic and the complexity of the city roads, it is not recommended for tourists to drive. In case you really need car rental, you may consult your hotel, and be ready with your passport and driving license. The KCR is the major railway which links up the New Territories and the city of Kowloon. It runs through Tsim Sha Tsui East to Lo Wu which takes about 40 minutes for the whole route. Lo Wo is the final station which you could pass through to enter China with valid visa. The train will depart for every 3 to 10 minutes, and the earliest one will be started at 5:35 a.m. while the last one will be departed at 12:20 p.m. The ordinary fair and the first class fair are HK$18 and HK$36 respectively from Hung Hom to Sheung Shui. The tram service has been started in 1904 and it is the oldest transportation system in Hong Kong. It only services the Hong Kong Island running from Kennedy Town to Shau Kei Wan plus another route to Happy Valley. The earliest tram starts at 6: 00 a.m. and run until 1:00 p.m. and the fair is HK$ 2 for adult and HK$ 1 for children under age12. It is the cheapest transportation in Hong Kong, and you are highly recommended to take a ride at the upper stairs so that you could enjoy all the street scenery of Hong Kong. 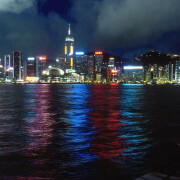 The scenery of Hong Kong harbor is famous in the world, especially the night scenery. Besides, there is spectacular light show by the commercial buildings in the Hong Kong island at 8:00 p.m. every night which you must not miss. The Star Ferry has been serving on the harbor for more than 100 years, and the fair is less than HK$3 per rides. You could take the Star Ferry from Cental to Tsim Sha Tsui at around 8:00 p.m. You could enjoy the harbor scenery on the ferry and continue with the light show at the Starlight Road of Tsim Sha Tsui. The most convenient route to the Hong Kong International Airport is through the MTR which takes about 23 minutes from Central. It passes through stations of Kowloon, Olympic, Tsing Yi, and the train will be departed for every ten minutes. With the MTR, you would never miss the airplane due to the traditional traffic jam. Other than the MTR, you could take the Airport Bus which starts from 6:00 a.m. at the morning until 11:00 p.m. at night. It covers most part of Hong Kong Island and Kowloon with major hotels.